This is a new special children's chapter book about a boy named Peter who raises Pax, a fox, as a young kit. The two have a close and loving relationship. 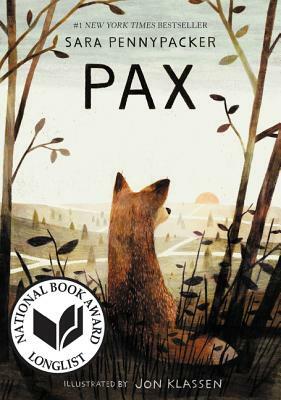 After the death of Peter's mother, his father joins an unnamed war and forces him to release Pax into the wild. Peter's father takes Peter to live with his grandfather. Peter regrets setting Pax free immediately, and strikes out on his own to find Pax. Pax, meanwhile, has been thrown into a wild life that he has never known. He has to learn to hunt and eat wild things, not the human food that he was raised on. He misses his boy and is trying to find him. Eventually he finds wild foxes who reluctantly let him join their group and begin teaching Pax their wild ways. There is a lot of adventure and danger in both Pax' and Peter's long adventure and there is some sadness too. The book holds some important messages about truth, loyalty and love. This book was a great nature read. I read it in an afternoon and am really excited about it. I feel like it will become a children's classic. This is another great children's book that makes a wonderful present, and one that you'd enjoy reading too.